LuLu's is located right on the Intracoastal Waterway in Gulf Shores, AL. The property is complete with a beach where kids can play in the sand, a three-story Mountain of Youth Ropes Adventure Course, Bama Freeze, Fountain of/for Youth, Fun Arcade, and multiple bars where Parents & Patrons alike can enjoy. Make sure to stop by the Merchandise Shop for our famous LuLu's Tees! LuLu's is famous for this "Lower Alabama" recipe. It is the local ingredients and flavors that make this dip delicious: black-eyed peas, chopped red, yellow and green bell peppers, and quartered cherry tomatoes. Additions like parsley and red onion add an extra kick of freshness, and then the veggie mixture is tossed with a dressing of balsamic vinegar, olive oil, black pepper, salt and sugar. Grab some chips and dig in -- this dip is great for a crowd or just a simple appetizer for two. Owned by Lucy Buffett for nearly 15 years, Lulu's at Homeport Marina is known for its laid-back approach to food, live music and a quintessential beach vibe that won't disappoint fans of Lulu's brother Jimmy. 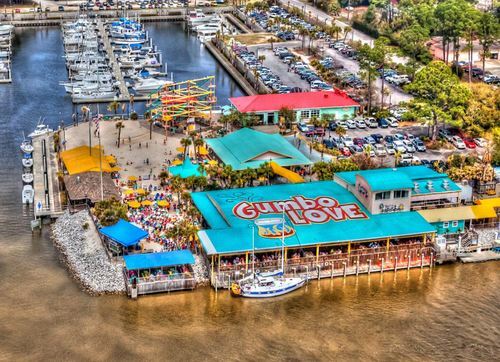 The menu is full of fresh seafood, fried favorites and Lulu's originals, such as Lower Alabama Caviar and Lulu's version of the Cheeseburger in Paradise. The burger’s namesake song, “Cheeseburger in Paradise,” was written by Jimmy Buffett after a long boat journey in the Caribbean. Buffett had survived on canned foods and peanut butter and jelly sandwiches, and longed for a hot, juicy burger. After finally arriving in the Virgin Islands, he was surprised to find a food stand serving American-style burgers. He had found his cheeseburger in paradise, and the rest is history. While it's not the original Jimmy found at that island food stand, LuLu’s spin on the burger is famous in its own right. 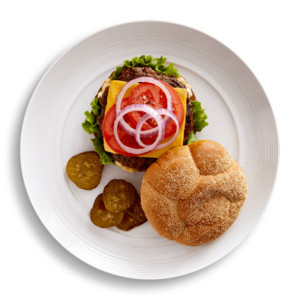 The hand-pattied burger is made with all natural, grass-fed beef. Because the cows are brought up in open grass pastures, they feed on a diet that’s not loaded on starches, which can unnaturally fatten the cow. Seasoned with LuLu’s Salty Peppa, the burger comes with all the fixings: lettuce, tomato, red onion, sweet pickles and your choice of cheese.